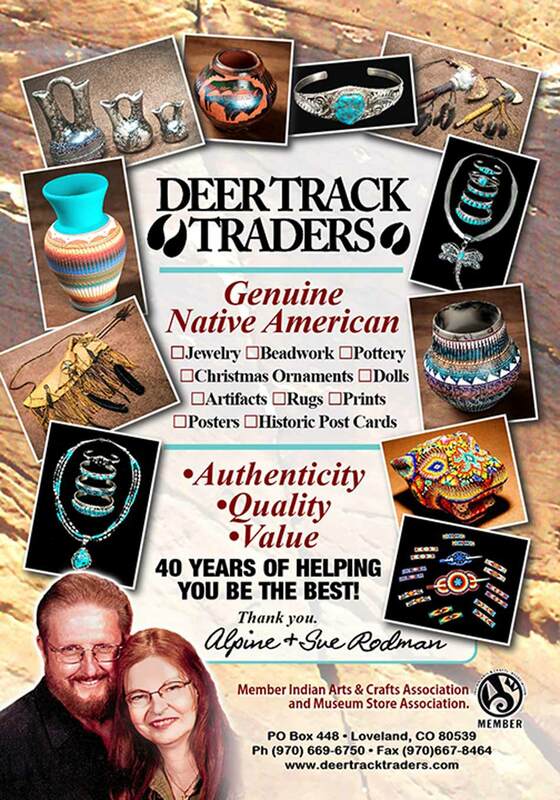 Deer Track Traders was started May 1st, 1975 by Alpine and Sue Rodman. It was a tiny company with a simple philosophy: value, service and quality. Alpine had already been buying, selling and trading American Indian Goods since the age of twelve. He is an accomplished silversmith and stone-cutter. He has a passion for making new friends, making him a natural for business. He has written several articles about Native Americans and their arts & crafts. He is a past president of the Indian Arts & Crafts Association. Alpine also enjoys writing poetry. Sue, while more reserved, has an artistic background. She has always been an artist. Sue attended college majoring in graphic design as well as jewelry and metal smithing. A thirst for knowledge has been fueled over the past forty+ years by constantly doing research on all aspects of Indian culture and crafts. A knowledge she has shared by writing numerous articles on sand painting, jewelry, beadwork, dolls, baskets, Navajo weaving and various aspects of Native American life. Connie (Alpine & Sue’s daughter) has been raised feeling the business was her sibling. She has spent almost her entire life in a love-hate relationship with the business, being dragged from one end of the country to the other, from reservation to reservation, from show to show. After all of this and graduating from college with a degree in Performance Theatre, she managed an Indian/Western store for a while. She returned to Deer Track bringing with her a lifetime of experience in business and an abundance of enthusiasm and creativity. With the help of Alpine’s mother, Verna, and our extended business family: Charlotte, Donna, Ernie, Carol, Frank, Graham, Glen and Carolyn, we face the future with confidence and optimism. Given our broad range of products and knowledge, we are well prepared to face the challenges of an ever changing industry. By making Deer Track Traders a vital link in your chain, you are assured the Indian craftspeople are being treated fairly and you are receiving quality product at a competitive price.